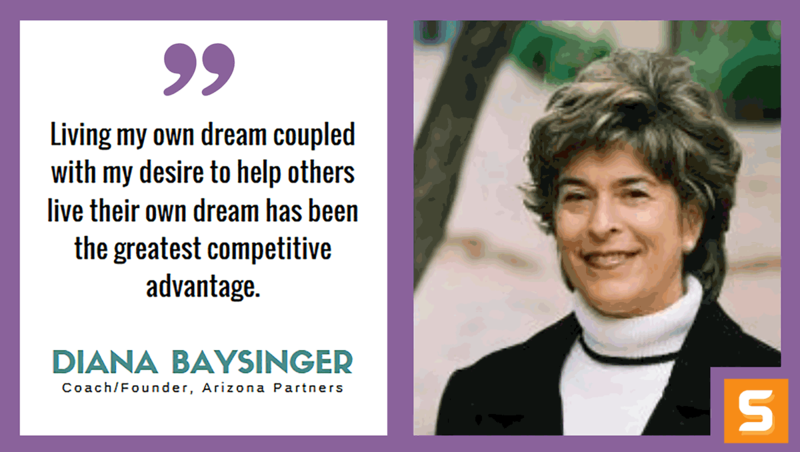 Diana Baysinger is the founder of Arizona Partners, an international coaching and consulting business. She has been a pioneer in developing leadership programs for educational institutions, non-profit organizations and corporations throughout Arizona. In this interview, Diana unveils her biggest secret to keep a business healthy -- building consistent and personal relationships with clients. Diana inspires the global community through the Best Year Yet coaching program, which has impacted over a million entrepreneurs and clients in 32 countries. Find out more about Diana's 'secret sauce' to obtaining loyal clients and building a successful business in this Startup Savant interview. Enjoy! My first business idea was as a real estate agent when I developed a successful system of attracting and securing “for sale by owner” clients. I learned that effective business systems that are consistent, personal and client focused helped develop relationships and a reputation that was grounded in mutual trust and respect. How did you get the idea for Arizona Partners? Is there something you wanted to do different or better than your competitors? I was in a partnership with a colleague and we were licensed to deliver a coaching program called Best Year Yet. Best Year Yet is a global organization that has a 35 year history of providing programs to over a million people in thirty-two countries. We were the only licensed coaches in the state of Arizona so Arizona Partners was a natural progression for the business. It also reflects the philosophy that our service is a partnership between our coaching service and our clients. Arizona Partners is more than a coaching and consulting service, we help people and organizations transform their lives and businesses. As the CEO, I work with individuals in transition, non-profit organizations, educational institutions, leaders and teams in large corporations. As a leader in the Best Year Yet global community, I have trained and worked with people around the world. We focus on sustainable results. This alone sets us apart from other services. Our clients work from the inside out developing skills and abilities to transform their lives, their businesses and sustain their success. What attitude/habits helped make you successful while starting Arizona Partners? I am a creative, committed and compassionate person. I have used the Best Year Yet strategic planning system for myself for over 15 years. The results of my own personal and professional success have attracted ideal clients who want to take their own lives and businesses to the next level. I stayed in a business partnership out of a sense of obligation to a partner who helped me get started in the business. As I began developing a clear vision for Arizona Partners and securing my own clients, she went in a different direction with her own vision for the business. I trusted that the natural order of respecting each other and the differences in our goals for the business would transition our business relationship and it did. She went on to develop her own business and I kept Arizona Partners and secured new partners. I use the Best Year Yet application, Producing Results Online. This tracks my progress on a monthly, quarterly and weekly basis. I use Quicken for accounting and tax information. What are your visions for Arizona Partners? Where do you see it in the next 5 years? At this stage of my personal and professional development, I am living the vision for Arizona Partners. Over the last 15 years, I have developed a reputation and service which now sustains a strong and ideal clientele. In the next 5 years, I plan to sustain the business and continue to attract leaders and entrepreneurs who have a vision for their own business growth. What makes Arizona Partners unique from others? How did you find your competitive advantage? My clients experience significant growth in their ability to define and reach their personal and professional goals. Before starting Arizona Partners in 2001, I was a licensed marriage and family therapist in private practice for over 25 years. My professional experience brings a depth of understanding and compassion for the human experience that is unique. Living my own dream coupled with my desire to help others live their own dream has been the greatest competitive advantage. I work in partnership with other coaches. Coaches who join Arizona Partners are trained in the Best Year Yet system and have a goal to become my successor when I retire. I have a balanced schedule that starts with good nutrition and exercise every day. I use a daily calendar that drives the action items that need attention and secures my appointments. I travel a great deal for business and pleasure so the Best Year Yet weekly plan keeps me focused during times of change. I suggest that people who are interested in having a business in Arizona do their research.